have fun! And report back with pix etc. Here's the tracklisting of the upcoming album Oblivion with Bells. There was a tracklisting on the loud.jp site but it had an error. This one comes from UW HQ. Someone posted a MTV party zone massive megamix on youtube, containing some underworld. Screengrab of the clip played at the end of the Culture Show on BBC telly. They played Born Slippy. I think this must have been very funny to see. 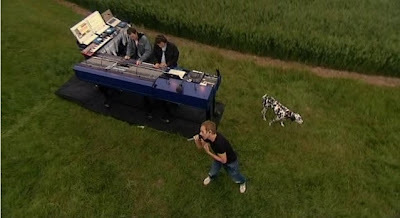 Since they used in-ear monitoring (and headphones) and no PA there was no sound other then karl dancing and the dogless-dog sniffing around. News about the new album and tour is spreading fast now. Japan will see some live dates in November too, TBA. Most pre-sales started today or later this week. After all the sad news of last weekend, great news today! First of all, UW let us know that Rick is doing well again. Then the other good news. 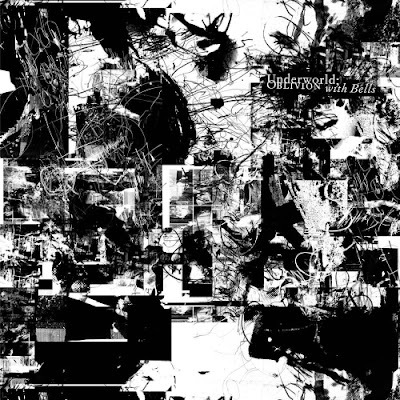 Underworld palette been so rich. There's now also a statement by the promotor, Detox, at their myspace website. Since it's a jpeg, I can't use my online translators to try to translate it. So.. if somebody would kindly give it a go, please put it in the comments. Underworld have released a press statement about the incident. UNDERWORLD MEMBER INJURED AS GANG STORMS STADIUM. 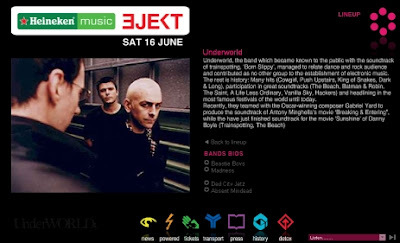 Underworlds’ Rick Smith, Karl Hyde, Darren Price and crew were caught up in trouble reportedly caused by “anarchists” at the Eject Festival in Athens on Saturday night (16/06/07). Underworld were scheduled to close the festival that also included Madness and The Beastie Boys. It is reported that a group of around 30 masked individuals, armed with CS-gas, iron bars and baseball bats stormed the stadium at around 11.20pm as The Beastie Boys were performing. As cars were burned and property damaged, the stadium was evacuated. Underworlds’ Rick Smith was one of the injured. He was hospitalised for a time in Athens, but has now returned to the UK for further treatment. Several other people including security guards were seriously hurt. NME reported about the incident here. pictures on a site in greek.
' Little before the appearance of Madness it began first traditional “[ntoy]” those who they waited for patiently their line. Afterwards, the battle with [eiselthontes] follow the did decision of (need? him we will learn tomorrow) is left free the space of entry - pray, however, in the hands those who they came in order to they cause villain. In this cases comes first the safety of big mass of world, conform. However: the absence of any element of control can deter from potential episodes, but it allowed the predominance of anarchy. From and afterwards the surrounding space was at some time dominated from [koykoyloforoys] and [kranoforoys] with [gklomp], that burned cars, threatened even the world that was in the toilets, chased even persons that simply had the vip [paso] (him we saw also this with our eyes!). Lack of culture? More here, again in a online translation. There's news from different sources now (non official sofar) that it was announced at the festival that Underworld weren't going to play because one of the members got hurt during the attacks at the backstage area. :( Let's hope everybody is fine. Here you can view a 7 min. phonecam video of the Turkey concert. Sound is terrible as you would expect. Next concert is tomorrow, june 16th in Athens, Greece at the Ejekt Festival. http://www.rockradio.gr is mediapartner, dunno if there will be a live stream, let's hope there will be one. Today there was news about a concert on a festival in Ireland. More details will be released soon. The gear is packed, as you could see in a picture at uwlive a few days ago. 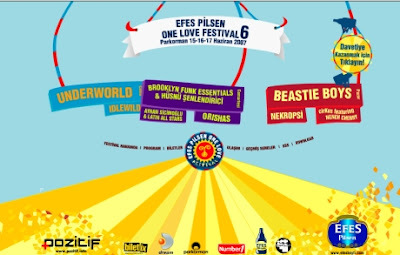 It's been send to Istanbul for the Efes One Love festival. Friday june 15th the first concert of the new worldtour will happen. Underworld have been filmed by the BBC for the Cultureshow program. This will be broadcasted in the near future. I'll post details when I have them. Here's a piece of the 1998 Arte docu called Universal Techno. The archive has been updated again, this time with more video from Moscow and in the audio section 2 tracks of the fabulous Zurich concert have been posted. There's also some news about the concerts in the near future.